From the Namib desert to the Victoria Falls is an extraordinary journey crossing amongst the most diverse landscape and natural wonders, going through deserts, savannahs and ending with the majestic Zambezi river. 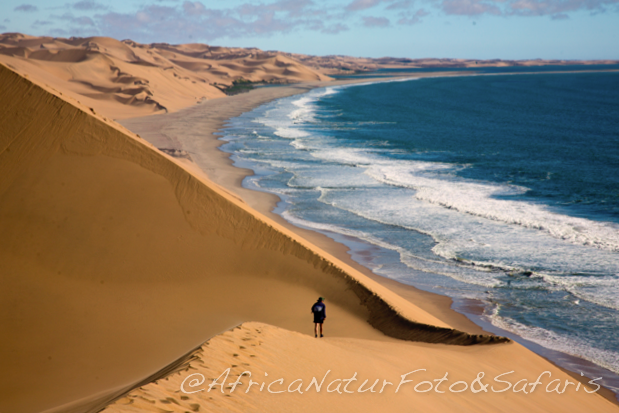 This tour begins from the Namib desert, and will visit the Sossusvlei dunes in the Namib Naukluft Park, then the Kuiseb delta and Sandwich Harbour on the coast, three days exploring the Etosha Park populated with wildlife with its many waterholes. We will drive through the Bwabwata Park situated in the Zambezi region, moving into Botswana, a boat safari on the Chobe river. Ending the tour with the spectacularly and majestic Victoria Falls in Zimbabwe. A 13 days/12 nights tour “all inclusive” formula and overnighting in medium/high level accommodation. A specialized guide will accompany you on this tour. Arrive at Windhoek International Airport and meet with your guide. Transfer by vehicle to Sesriem, in the Namib desert, passing through Spreetshoogte Pass from which you can enjoy a spectacular view that introduces us to the desert then a must top at Solitaire. Arrive at the lodge in the late afternoon. Overnight near entrance in the Namib Park. Depart before sunrise, the dunes have a striking apricot color with the first rays of sun illuminating them, that will be the perfect time to start taking pictures. Reaching the Sossuvlei area and visit the very suggestive skeleton tree white basin named “Deadvlei”, with one of the highest dunes in the world. If you feel adventurous, you can climb the tallest dune “Big Daddy”. We will have the opportunity to see also some animals such as springbok, Oryx, ostriches and more. In the afternoon we will visit the Sesriem Canyon. Overnight near entrance the Namib Park. Depart in the morning for Walvis Bay, on our way we stop for a photo on the Tropic of Capricorn. The landscape is now rapidly changing, bringing you new colors with mountains, the Kuiseb canyon and open plains. In the afternoon we arrive in Walvis Bay and can take a walk along the lagoon where we can see many flamingos. Overlooking the Walvis Bay lagoon. Today is dedicated to discovering the desert surrounding Walvis Bay right up to Sandwich Harbor. We will visit to the Kuiseb delta to experience the life in this desert, comprehend the survival strategies of creatures that can only be found here in Namibia. You will be able to see a wide variety of seabirds such as flamingos, cormorants, plovers and breathtaking views. We will reach Sandwich Harbour where the golden dunes meet the Atlantic Ocean. During this entire time you’ll be in the company of a Nature guide. A pic-nick Lunch will be served between the dunes. Transfer to Etosha Park and in the afternoon you’ll start your first safari in the Okaukuejo area. The Etosha Park covers an area of 22.270 km² making it one of Africa’s biggest parks and it’s unique landscape is dominated by the white salt pan of 4.590 km² called the Etosha Pan. Etosha is home to 114 species of mammals and 340 different species of birds which can be found here all year round. As the sunrise you’ll start your photo safari in one of Africa’s most famous natural parks. We will visit some of the many water holes of the park and we’ll admire the animals that come and go to quench their thirst: like Gnus the arrogant Oryx the majestic Elephants, and the elegant Giraffes, along with the many Springboks and many more. Overnight inside the Etosha Park. This day is dedicated to a safari tour in the park. Here you will see the predators, amongst them the powerful Lion, the burly Hyenas, the shy Leopard, and the rare Cheetah. We will travel the vast savannah as far as Andoni, almost reaching the northern borders of the park. We will have the opportunity to see the Impala (which is endemic), the Kudus, Zebras, Hartebeests…and many bird species such as the colorful lilac-breasted roller, along with many other. In the morning we’ll have our last safari in Etosha Park and then drive to Rundu in the Kavanga region, arrive late afternoon at our the lodge situated along the Kavango river. Overnight, in the proximity of Rundu. Today we travel east, during the morning we’ll stop and visit the Papa Falls rapids of the Kavango river. We will cross Bwabwata Park and arrive at the lodge located on the Kwando river banks. In the afternoon we’ll go out on a boat safari and you’ll have the opportunity to admire the magic light of African sunset. This morning we drive to Katima Mulilo and then transfer to Botswana through the Ngoma border. Once all customs procedures are cleared, we will proceed briefly through Chobe park going towards the town of Kasane situated at the border of the park along the Chobe river, the rivers itself serves as a natural border with Namibia. Overnight near entrance the Chobe Park. Today we will have two safaris in Chobe park: a safari in open 4×4 vehicle along the of Chobe riverfront and a boat safari on the Chobe river. During our safaris, we can see Hippos, Crocodiles, an amazing variety of birds, Impala, Kudu, Giraffes, Buffalos and the rare Sable Antelope . 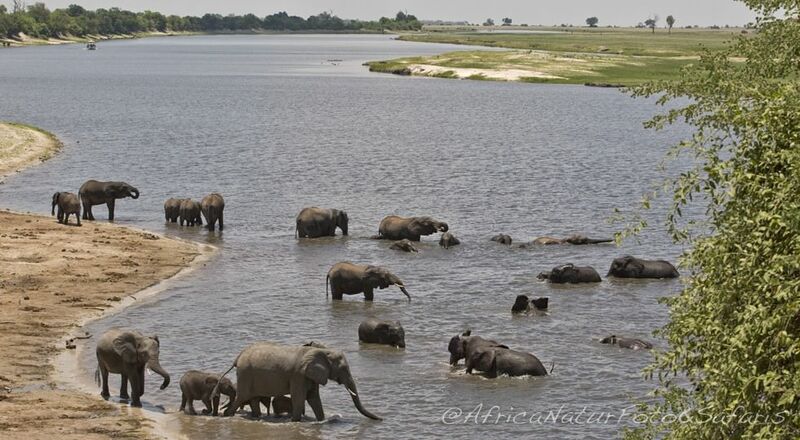 This part of the Chobe river boasts a high number of Elephants and will see Elephant families going to drink, play and bath. After breakfast we will transfer to Zimbabwe and arrive in Victoria Falls for lunch. In the afternoon visit the majestic Victoria Falls, discovered by David Livingstone dedicated to Queen Victoria for their majestic beauty. Overnight in Hotel in Victoria Falls. 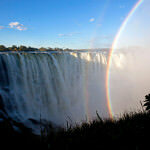 Transfer to Victoria Falls International Airport in time for your return flight.